Swiss-born Taiwanese cellist Wen-Sinn Yang is one of Europe’s great virtuosos, dispatching the most daunting works with fearless ease. A devotee of contemporary music, he has given premieres by such eminent composers as Pierre Boulez, Henri Dutilleux, Kevin Volans and Lorin Maazel. An active recording artist with over 20 releases to his credit, on this new Avie disc Wen-Sinn claims the spotlight exclusively. 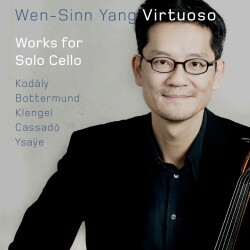 Featuring solo repertoire that straddles the 19th and 20th centuries, all performed with awesome virtuosity, the result is a generously-filled album that is a must for all cellists and a thrilling ride for any music lover. At the age of 24, Wen-Sinn became principal cellist of the Bavarian Radio Symphony Orchestra and 15 years later was offered a chair at the Munich College of Music. In 1991, he won the Geneva International Music Competition and has since performed all over the world, collaborating with conductors such as Sir Colin Davis, Wolfgang Sawallisch, Semyon Bychkov and Mariss Jansons, and performing chamber music with the likes of Eduard Brunner and Helene Grimaud.